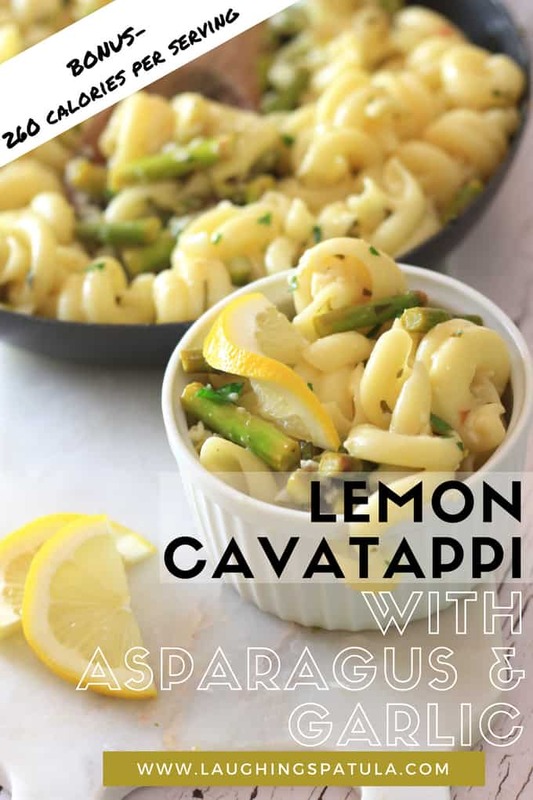 Lemons are so versatile- I love them in any form, but mostly in savory dishes. 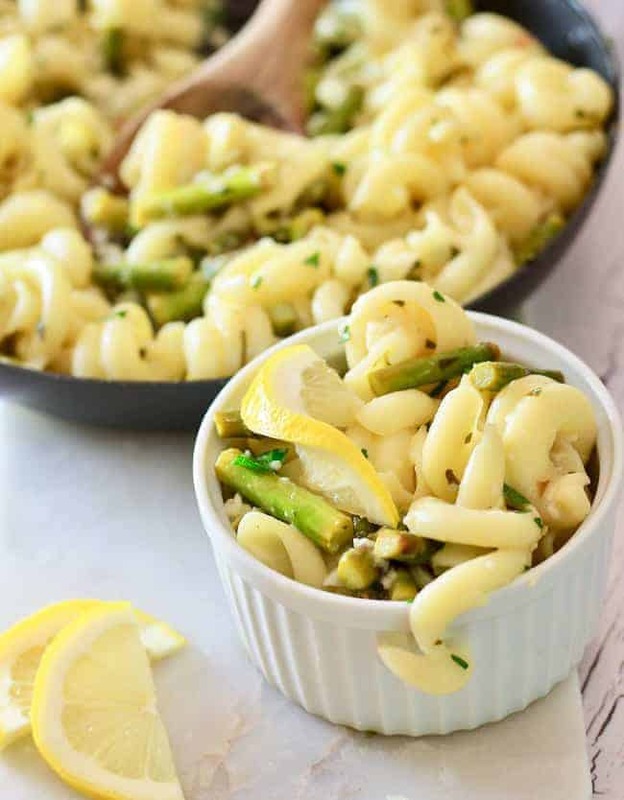 This Lemon Cavatappi with Asparagus and Garlic is perfect for any time of the year, but it’s bright flavors are PERFECT for a summertime dinner. Bonus- it’s vegetarian! For you non-vegetarians, don’t fret- it’s got SO much flavor you don’t even need meat in it, but…you could throw in some rotisserie chicken if you really needed to. As is- this dish is 260 calories per serving- score! Delicious in a bowl, or straight out of the skillet! I bought some really good asparagus from our local produce stand, and it was SO fresh and delicious. I always forget how much I love asparagus! 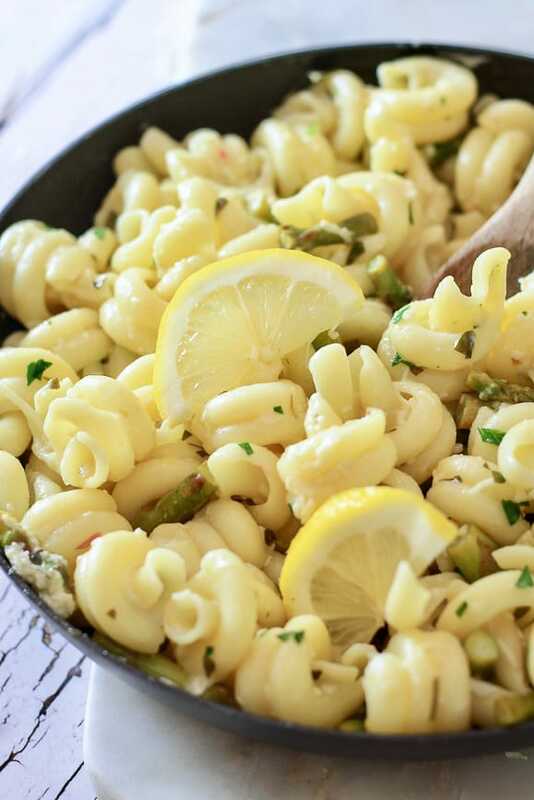 Pair it with garlic, lemon, and parmesan alongside some pasta….yep, I’m on board. Start by washing your asparagus, and cutting the ends off. 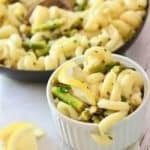 I’ll show you a few pictures of how I cut my asparagus, 1) how far up I cut off my ends, and 2) the side of asparagus chunk I used for this lemon chicken asparagus pasta dish. They’re about 1-1.5 inches long. 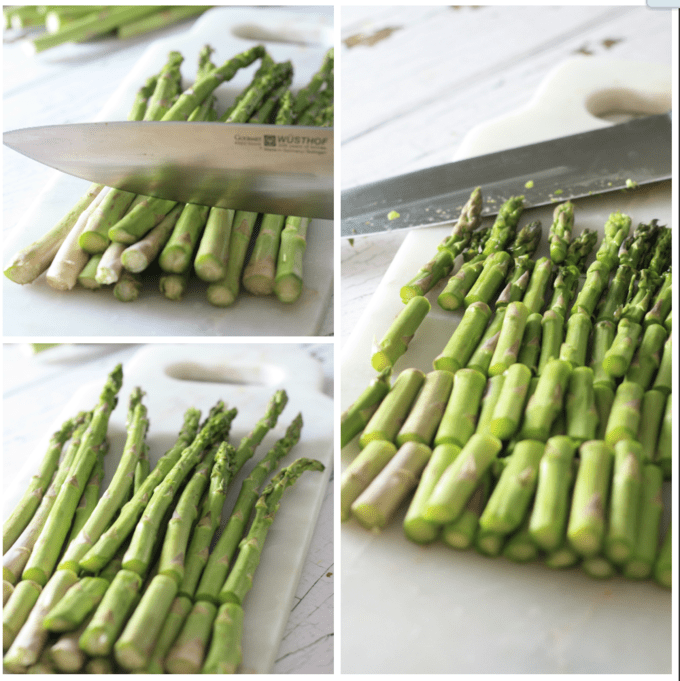 How to cut your asparagus: Remove the ends about an inch upwards, then slice into 1-1.5inch chunks. While I chopped my asaparagus, I boiled my pasta- you’ll want to keep about 1/4 cup of the pasta water to use in your skillet, but that’s for later . I used Cavatappi, which is Italian for ‘corkscrew’. #themoreyouknow. You could use any shaped pasta with this dish- even Orzo would be fabulous. I chose Cavatappi becuase- well, I’m frankly not sure, I just like the shape! Once you’ve boiled your pasta (to your liking- whether soft or al dente), and reserved a 1/4 cup of your pasta water, strain the pasta, and toss it in olive oil so it doesn’t harden or stick. Get ready to toss your sauce and asparagus- we’re almost there! This is a really simple dish, and the sauce is just as simple, but it packs a punch of flavor. 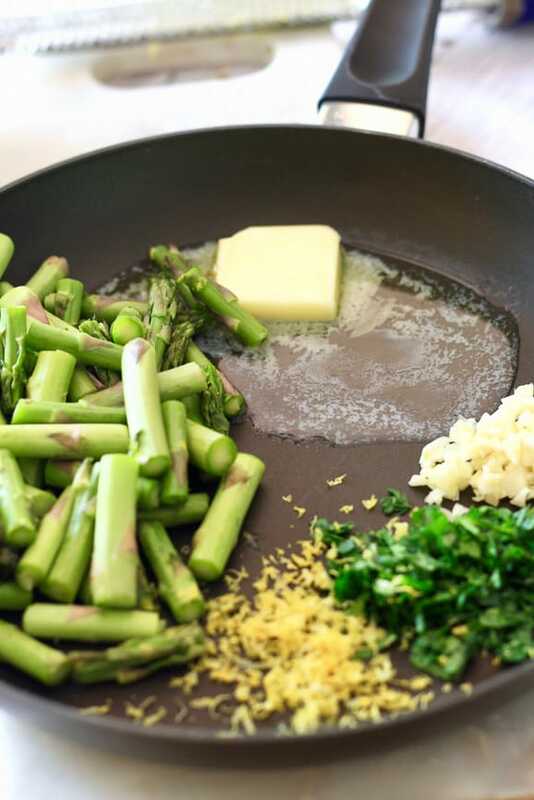 Combine butter, lemon zest, parsley, fresh garlic, and lemon juice into a skillet and toss on medium high for about 3-5 minutes. Careful not to overdo it, otherwise the asparagus will turn mushy, and we don’t want your asparagus to be mushy. Pour your pasta into your skillet. Once you’ve poured your pasta into your skillet, turn off the stove, you’ll add in parmesan cheese, and the leftover pasta water, toss some more, and boom! Dinner is READY! Garnish with lemon slices, and some fresh parsley- delish! We love a quick healthy meals so much we have over 100 recipes HERE! A few of them that we make all the time are this Greek Sheet Pan Dinner with potatoes, veggies and chicken all cooked at the same time on the same pan! And this 15 minute Cauliflower Rice with Feta and Thyme….you won’t miss the carbs of the rice with this flavorful dish! And check out our new YouTube channel! 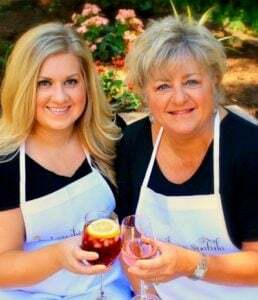 We are working on videos for all our most popular dishes! To healthy, fast and fresh meals! A delicious, zesty dish that's vegetarian friendly! Boil pasta according to package directions. Reserve 1/4 cup pasta water and set aside. Drain pasta. Toss olive oil over warm pasta to prevent it from sticking together.. 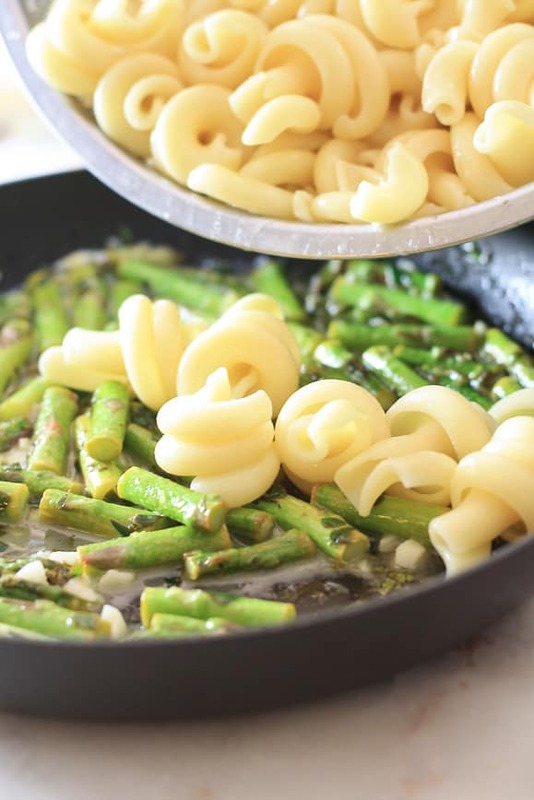 In small skillet, combine chopped asparagus, and skillet sauce ingredients. Cook on medium-high for 3-5 minutes, until bubbling. Add in cooked pasta to skillet, along with reserved pasta water, and parmesan. Turn heat off, and toss until fully combined. Garnish with parsley and lemon slices if desired. Enjoy!